It was a relaxing day, I waved goodbye to son Jon and his friends as they headed off to Anacapa Island for a bit of diving. James and Denny were going diving also, but on the Rapture accompanying my nephews that were getting their open water dive certifications (check this resource). It pleases me that the kids are quite comfortable when it comes to water and I remember their first swim lessons with a smile. The plan is for me to make Chowder, and if Jon has any luck with his fishin’ pole, we may have fish chowder. I won’t know until they return late in the afternoon. So, I start my soup base in hopes of some additions. Boil potatoes until fork tender in chicken stock. Add water to cover the potatoes as necessary. In a frying pan, cook the bacon until crisp drain on a paper towel. 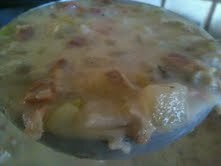 Then add celery and onion to the bacon grease and saute until tender. Add the celery and onions to the simmering potatoes. Add nutmeg, salt and pepper (about 1 tsp each) to taste. Keep the water over the potatoes adding more as necessary. I turn off the stove at this point as I want to take a bath and wash the dog. I leave the soup on the stove, with the fire off. We will wait for the catch of the day. I love taking baths, Lily my doggy tolerates bath day. I typically have to drag her from under my bed and into my bathroom. Tolerates means she complies but just as a teenager would…dragging her feet and becoming dead weight. Funny! I thought, this time while she would be in the bath, I would use that moment to take a small sample of her saliva for a DNA test, I read this DNA test review and realized that there are a slew of complications that can be easily tested for. Anyway, I soap her up and never am able to wait the required time for the flea shampoo, but I coax her into waiting a couple of minutes and then put her in my used bath water. I scrub her ears and face, all the while telling her how much I love her. After rinsing her, I towel dry her. She will allow me to dry her as much as I can, and then upon removing the towel ask her to shake. She gives one big shake, and she is ready to lay in the sun. She is a few shades lighter, blonder. Then tub – I give it a quick rinse and follow Lily downstairs to finish my soup. James rings my phone, I answer brightly and he informs me, one of the tenants has called and the fire department is at the office building and there is some sort of water leak. Hmmm, emergency. I am in my dog washing clothes…They will have to do. I slip on my sneakers and head out the door. I am a sight, my hair is wet and I look like…well, like I just washed the dog. I sooth my ego as I drive the 10 minutes to the building I now wish I did not own. Oh, the pleasures of ownership. I choose the freeway thinking it will get me there quicker, but Sunday afternoon traffic is always slow heading toward Los Angeles. I tell myself to stay calm, breath and remind myself to gather information and assess the situation. As I pull up to the building, I see the fire department. There are hoses pumping water out of the building and there seems to be a new “water feature” pouring out the front door. There is mud and water all over the parking lot. I abandon my car on the private road next to the parking lot and decide to walk in verses drive in. I see the tenants and they seem to be trying to make the best of the water. I introduce myself to the firemen working with their machines that are sucking water and mud from the carpet. They are saying how lucky the tenant is that their books are on shelves that are on wheels and one of the firemen introduces himself as Matt. He informs me what he believes has happened. A water main, the fire water feeding the office fire sprinklers has broken outside the building. The water from the outside pushed its way into the building taking the dirt, now mud into the building. It has flooded about 1/2 the building. There is a valve to shut off the sprinkler water and they have that off. As I take it all in, and it is quite overwhelming, it appears to me that water is still gushing from the “wound”. I ask Matt if it appears normal, and ask if there are other valves that need to be shut off? James, son, back on land, arrives at the scene. I ask him to shut the water off to the landscaping sprinklers and the other valve that feeds the sinks and toilets in the building. He returns and we watch the hole that has been excavated by the broken pipe, but is continues to bubble. Matt decides that perhaps the sprinkler pipes in the ceiling are still “charged”, he goes inside and a few minutes later a big gush of water discharges and we look for signs the water has stopped. I ask James to find a shovel, and then a fireman overhearing the comment, steps up with a shovel and tells his boss that he is going to shovel a small ditch so the water coming up from the planter will spill away from the buiding into the parking lot directly. He shovels two or three mud filled spades and that small amount of dirt removal relieves the pressure of the water and you can tell the water stops entering the building. The firemen start to talk and now decide the Post Indicator Valve has failed in addition to the broken pipe. I ask how to shut off the water to the Post Indictor Valve and they point in the direction of the big valves in the corner of the property. The only thing I know about these valves is that they have to be checked every year for backflow prevention. The fire department have retreated and I am handed a “NOV”, better known as a Notice of Violation to have the problem repaired and restore the fire protection to the building. Matt the fire department spokes person has informed me that I need a special plumber that is certified in fire protection to do the repair. He also informs me that plumber will be able to shut off the water that continues to leak. I remember someone saying the fire water main coming in from the street could be 8 or 10 inches. That is alot of water feeding my leak. I have been making a few calls during my assessment, trying to call my insurance guy, Pat. No answer, but I have called State Farm and have a claim number. I call the person I used last time to inspect the fire protection systems. It seems Ron has moved out of the area, but he gives me two names of companies that are local. I ask my nephew Ryan to call and see if he can get them here. I call the plumbers that check the backflow devices each year and their on call plummer has arrived, but he doesn’t work on commercial systems. That specialist is on his way. The water continues to flow into the parking area. I am hoping the fire water main is not metered, otherwise my water bill is going to be sky high. At last the specialist shows up as my husband and the rest of the calvary arrive and the main fire water is temporarily shut off for repairs. I leave the scene, having set an appointment with the plumber for the morning. My soup is on the stove, I reheat and serve myself. Service masters has classified this leak as a Category 3 intrusion and want to remove part of the drywall along the walls so everything will dry out. Oh my, I decide to call State Farm, my claims agent to see if they want me to do that. The agent assigned to my case is not available, but someone else looks thru my policy and tells me, yes. Let Service Master do what they do, we are covered for all they do. I call back Service Master and tell them to go ahead. I have gotten help for the tenant to remove her personal items so the carpets can be removed by Service Master. We have more fans and dehumidifiers going, practically every other foot of floor space is covered. They now want to remove the carpet from the back room where my tenant is insisting she needs “her library” since all the kids are picking up their books. It is the busiest time of year for her. Late in the day, my regular claims agent calls and tells me we are not really covered for the incident. What, I say? It was a submerged pipe and there for it is excluded from your policy. That being said, since we already told you we are going to cover it, we probably won’t change our minds. Now, that concerns me. “Why are you even telling me this then?” Joyce from State Farm just wants me to know for the future that this type of water damage is not covered. Well, that is nice to know. I make a decision to ask service master to step down, they are like cockroaches, continuing to remove and remove more and more of the building. They resist telling me they are the experts, but I need to keep my tenant happy. Meet with service Master they are removing their equipment. I will finish with a crew of less agressive people. I receive a bid from a contractor for the cost to rebuild/repair. Replace the drywall sections, carpet, paint. About $31,000.00, but that is just their first “draft”. Wow, that actual repair of the valve and pipe that leaked is about $3,000 dollars and my husband happened to have the valve that needed replaced. This is an expensive crisis! I have been asking Service Master for their cost breakdown, and finally it has arrived today. Their distruction cost is close to $25,000. Hmmm, somehow that just doesn’t make sense. I mean you when factor in having to purchase materials in order to re-construct, you would think that amount would be greater than the removal of wet carpet, drywall, and renting fans. NOTE TO SELF: DO NOT HIRE SERVICE MASTER AGAIN. There is a more cost effective method, there has to be. It feels like I am being taken advantage of and I don’t like it, even if the insurance company is going to pay for it. I will remove the rest of the carpet that needs replaced with a different crew of people. I will hire a drywall contractor, a painter and a local carpet company. Service Master has recommended a contractor they work with, but I believe I will stay away from that outfit all together. I think I will have a comforting bowl of soup. This entry was posted in Soup Kitchen and tagged Chowder, clam, Fish. Bookmark the permalink.